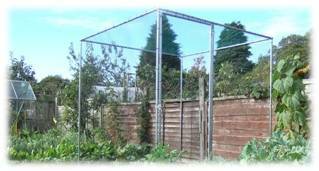 You can make up your own Fruit Cage from our range of parts. If you want to create a Fruit Cage to fit your space you can choose which fittings you want and perhaps cut the straight tubes to size. Or you can make an L-shape or C-shape fruit cage. Call us if you want to double-check your requirements. Our Fruit Cage Parts are suitable for steel or aluminium tube size 25.4mm diameter x 1.5mm wall thickness. Our Fruit Cage fittings are now galvanised instead of electro-plated - Not quite as shiny-smooth but vastly improved corrosion resistance to withstand the elements 365 days a year. Another small but important detail taken care of. 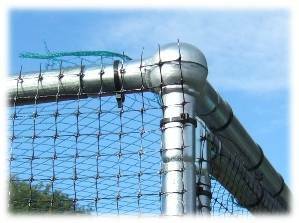 Swaged ground tube to support your fruit cage framework. Or if your ground is uneven, use as leg extensions! To make up the main framework of your fruit cage. 1.85m long to make 2m grid when used with our standard fruit cage fittings. To make up the main framework of your fruit cage. 2.35m long to make 2.5m grid when used with our standard fruit cage fittings. Use at each corner of your fruit cage. Hot dip galvanised for improved protection against corrosion. Use to connect the tubes along the sides of your fruit cage. Use at the internal leg positions for fruit cages 4m + in both length and width. Fruit Cage Door with an opening size of 0.8m x 1.97m (31 ½" x 77 ½"). Supplied complete with door frame, door posts, ground tubes, latch, hinges, net and all fasteners. For securing side net and top net to your fruit cage framework. 6" galvanised steel staple. Ideal for fixing ground cover, netting and fleece. Use them to secure the bottom edge of the netting on your fruit cage.